Check out more information on IC's speech-language pathology program. Learn more about Strides program. 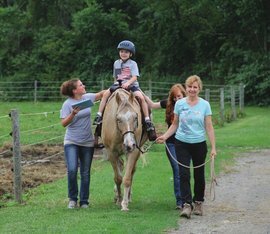 The program, called Strides, is an equine therapy program that incorporates a communication development component using speech-generating software on a device such as an iPad. Three graduate students—Lauren Vollmin, M.S. ’13; Maritsa Sherenian, M.S. ’13; and Caitlyn Bergin, M.S. ’13—worked on the program at a nearby horse stable. Strides focuses on increasing the children’s social-pragmatic language skills and social communication interactions with others. During the horseback riding sessions, the children use the iPad with the speech-generating software as a means to communicate. Parents, too, learn to use the device so that they and their children can take what they learn from the barn and use it at home and during other social activities. “The clients have made great strides!” says Caswell.